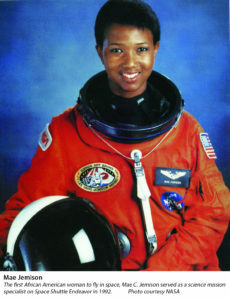 Mae Jemison has been making history throughout her career. She was not only the first African-American woman to be an astronaut but she was also the first African-American woman to be sent into space. Mae‚Äôs interest in science began at an early age and it continued throughout her education earning a National Achievement Scholarship to study chemical engineering at Stanford University. Mae went on to get her doctorate in medicine from Cornell University. Her career initially focused on medicine, she was a general practitioner before joining the Peace Corps where she visited Sierra Leone and Liberia. When she returned to the United States she applied to NASA‚Äôs astronauts training programme. In 1987 she was chosen and became the first African-American woman to be an astronaut, with her official title Science Mission Specialist. In 1992 she made more history by becoming the first African-American woman to go into space when she was a part of the Endeavour mission. She spent 8 days in space where she carried out experiments relating to motion sickness and weightlessness. She left NASA in 1993 as she wanted to focus her career on the relationship between science and technology. In 1995 she accepted a teaching fellowship at Dartmouth University where she taught environmental studies. She also founded her own company (the Jemison Group) that aims to research and develop and technology and science for use in everyday life. The Jemison Group also established a four week science camp for students who want to improve their scientific knowledge. Mae has a won a number of awards and accolades throughout her career including admission into the International Space Hall of Fame and honorary doctorates from a number of different universities. She also has the distinction of being the first real astronaut to appear in an episode of Star Trek: The Next Generation.